Horror movies have the potential to highlight the human race’s dark side so eloquently, whether it’s through a story taking place in the seedy underbelly of a dingy city overpopulated with competing automatons, one focusing on personal fears, or simply by nodding to the most primal potential in us all. I do enjoy a good scare that "gets under my skin" but most importantly I enjoy a good scare with depth and relevant metaphors. A few good tummy ticklers never hurt either. If this sounds like you, search no further. 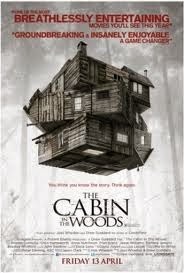 Cabin in the Woods is your film! Unfortunately, there is no way I could talk specifically about what happens in this film without ruining it. I honestly feel it would be best experienced going in blindly. I can say, however, that the young troupe of soon-to be-dead teens, played by Fran Kranz (Dollhouse), Kristen Connolly, Chris Hemsworth (Thor), Anna Hutchison (Go Girls) and Jesse Williams, eventually end up at, well, a cabin in the woods somewhere (no way!) and that the subtext is ripe and, most importantly, available on many levels…just as a Whedon-back-to-form project should be. Sure, Whedon only produced it but Drew Goddard, the director, has a rich history of working with Whedon on the likes of Buffy the Vampire Slayer (season seven) as well as the climactic season five of the epic yet tragically dumped Angel. I can’t tell you specifics about the kills or the "monsters" in cabin in the woods, it just wouldn’t be fair…I can say though that if you are a fan of Whedon, and especially the "seasons" of Buffy and Angel running in comic form presently (also contributed to by Mr. Drew Goddard), you will most likely be delighted. This film is like Whedon perfected…and horrific. It also seems to be influenced, craftily, by the 'Buffyverse' (what Whedon fans affectionately call the world the shows Buffy and Angel take place in). Characters battle their "demons" and "monsters" for real…and the end of the world is always just around the corner! Of course, even though our youths perceive multiple warnings and big giant gongs (!) should be going off about the integrity of their camping destination, they foolishly continue onward…even despite the cantankerous, bloodshot-eyed bumpkin they have an altercation with at a typical dilapidated gas station along the way. Now it is true that these cracked decisions are par for the course when dealing with a horror parody but this movie takes the analysis of horror movies and their oft-used conventions to a whole new level, each character representing an almost mystical archetype in horror. The Whore. The Athlete. The Scholar. The Virgin. The Fool? Ah yes, The Fool. You see, the Fool is Everyman. The Fool is us, the viewer. In the Tarot, The Fool is the most important card in the deck, representing the potential of all other cards and the beginning of the journey of life. He is not foolish in the standard sense of the word, but openhearted to possibility and true to Himself in all that he does. He goes forward with faith that his good intentions will bring positive things his way. The downside of The Fool is his tendency to overindulge, be impulsive and sometimes naïve. Cabin In The Woods is a clever character study of The Fool, equating his role in the film to the choice we all have to make between following our true 'inner voice' and the voices of those around us and in our heads (from TV, media, etc.). Times change and audiences have become keener. Whedon and Goddard understand that the ante’s up. If you want to do something fresh in horror one of the only ways is to take various elements of a tried and true nature and successfully splice them together with fresh commentary on social issues. There are so many social and political metaphors in this movie. You’ve got your very timely "we’re in constant war" reference…then you’ve got a bit of post 911 lock down. Hell, Cabin In The Woods even sneaks in some positive messages like "we all need to work together or The Powers That Be just might devour us all!" Wait, that one went south too. It’s indeed a whip-smart, dark horror comedy first and foremost but it also has the most intriguing subtext I have seen in awhile. Don’t blink and don’t go to the kitchen for snacks. Everything is relevant. My personal favorite comedic moment (during a kill scene) in this film…and there are a couple great ones…involves a unicorn. A unicorn?! My mind blew. It must be true, I thought to myself in the middle of some sort of twisted horror-logic epiphany. Somewhere out there in the world, there’s a poor old sod that is deathly afraid of…unicorns! I’ll just say Cabin in the Woods has something for everyone. My other golden moment with this film took place when one of the terrors encountered turns out to be the best flippin’ "Cenobite", puzzle toy and all, since Hellraiser 2. I just can’t decide if I love or lament that a parody of Pinhead is now officially scarier than…PINHEAD. Cabin In The Woods may very well be the best example of horror parody and examination of tired horror conventions to date (other than the obvious Scream franchise or perhaps Behind The Mask: The Rise of Lesley Vernon) but it is also a cautionary tale in its own rite. We humans are all beautifully flawed. And as perpetual Fools on the plain of existence, we must ask ourselves: Will we blindly follow structure and order purely on autopilot, or will we be brave enough to look inside ourselves and find our own Truth to help navigate us through this Collective Hell?